As a kid I already had a soft spot for animals. To my mother’s frustration I would bring home all sorts of stray animals to take care of and to find a new home for. I also really loved horses. Unfortunately, living in Indonesia, it was not very easy to find possibilities for riding horses. Luckily a colleague of my father owned a few horses and allowed me to take lessons on her magnificent animals. I had private lessons for a few years which made for a good start to my horse riding career. I was given the opportunity to ride many different horses and I learned a lot. 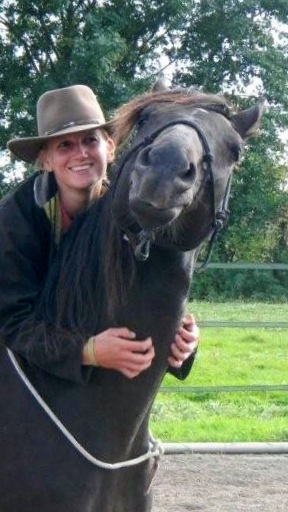 Once we moved to the Netherlands the horse “bug” stayed present. After sharing a horse first, my parents finally gave in and I was able to buy my first own horse. Unfortunately this lovely mare got kick in the head from another horse in the field and had to be put down only a year after I got her. 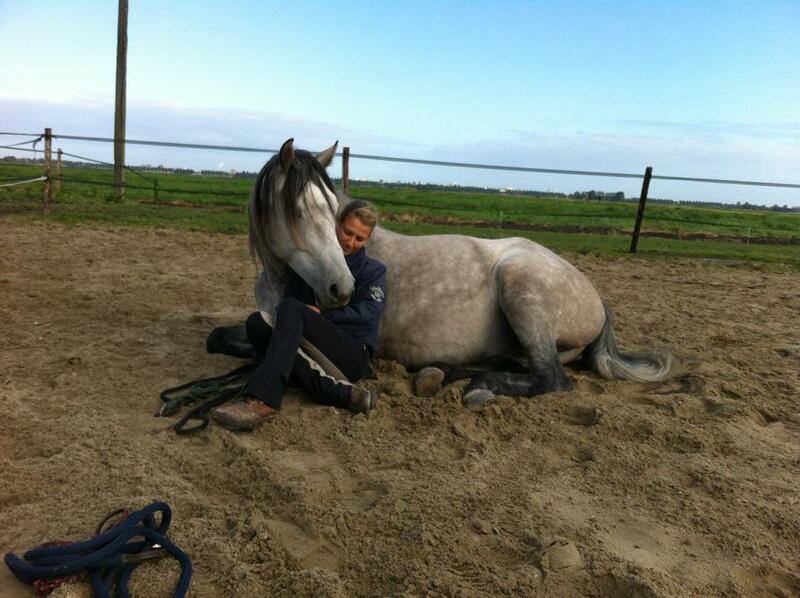 This is when one of my current horses: Orsini, came into my life. He turned out to be (and still is) a really good teacher. He was just barely started when I got him and we worked ourselves up all the way to intermediate dressage level together. Orsini is a horse with a strong character. He is a tad dominant and needs to have a good reason to work for you. Not the easiest horse to motivate! But this challenge taught me a lot. The most important thing was that I needed to give Orsini a good reason to be motivated to work with me. As mentioned this was not easy and in the beginning often ended up in some frustration on both sides. If only I knew back then what I know now……. Things would have been a lot easier ?. All goes as it should go they say….Orsini got a really nasty splint injury during our competition season. An injury for which they normally prescribe stable rest for quite an extended period of time…..But how was I going to keep my physically trained horse mentally sane if he was not allowed to move?! I had to find a way to keep his mind occupied, so he would be relaxed enough to allow his body to recover. This is when and how I got into contact with Natural Horsemanship. Wow, what an eye opener that was! Since then thing has been going really fast. I have learned and seen so much! I followed workshops with Parelli Instructors Michael Wanzenfried, Eddy Modde, Walther Gegenschatz, Silke Valentine and I even went to a 6 month internship in France. 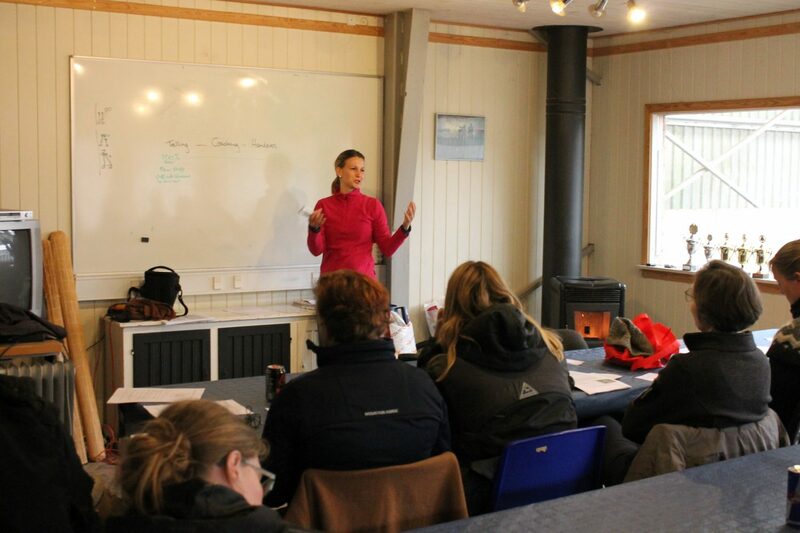 I also followed workshops with Karen Rohlf which are focused on dressage in a more natural way. In June 2010 I traveled to the US to spend a few weeks under the watchful eyes of Pat and Linda Parelli and finished the course with a high mark! I was asked if I would be interested in joining their instructor team, but I decided to continue to search for what I really considered to be my passion: combining natural horsemanship principles with the knowledge of the academical dressage. This search led me to Marijke de Jong and Straightness Training® (ST). In the meantime Orsi had already become a bit older (at the moment of this writing he is 21) so the time came to find a successor for him. I wanted a 3 year old, 100% green horse, preferably a Spanish breed. In the end I came home with a 6 year old Dutch Warmblood with the name of Belicimo! The only thing that remained of my list was that he was indeed 100% green and had only been handled to have his feet trimmed and to walk to and from the stables to the field or paddock. BUT the moment I met him, we had a connection that just made me decide right there on the spot to buy him. I have never had regrets since! Belicimo has been a challenging horse in his own way. Being a stallion for 6 years and with his breading background he sure knew he was handsome and strong ?. Luckily for me I had enough knowledge by this time to make sure we could work together as real partners from the start. In the beginning I spent a lot of time working on mutual understanding and trust from the ground. I backed him myself and he has never, ever tried to get me off his back. He has become a real partner and is always putting his best effort in. On the other side he also keeps me very focused as he will let me know immediately when my own focus drifts and when I am doing something wrong in his eyes. I can for sure call him my best teacher ever! Belicimo is now my Grade 3 Straightness Training horse and is growing further with me in the program. He has so much presence, charm and dedication to work with me, that I am really looking forward to see where we can go together in our journey. Of course Orsini is also still with me and I am keeping him fit by training him on a regular basis together with my sharers. They have been educated by me in the ST system and are therefore able to help me keep Orsini strong and fit, even though he is already 21! Since a few years I am allowed to officially call myself Straightness Training® Instructor. I am proud of this as currently there are only 18 people who are allowed to use this title. Straightness Training offers the possibility to balance your horse both mentally and physically. A (in my eyes) perfect combination between Natural Horsemanship and Academical dressage. Body and mind are connected and an unbalance in either one has a direct influence on the other. Therefore it is very important that we, as horse owners, are very aware of the fact that you need to address both aspects. You can find more information on ST here on my website, as well as workshops that I give. I hope this website can inspire you in your work with your horse(s) too! 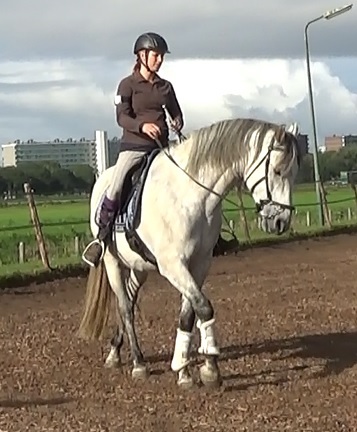 At the moment I just love to combine the knowledge and experience I gained from Natural Horsemanship and Academical dressage over the past years. This allows me to build a brigde between the more natural ways of training your horse and the benefits of physical training from dressage. In this way it is possible to keep an eye on both the mental and physical aspects and not miss out on either one. 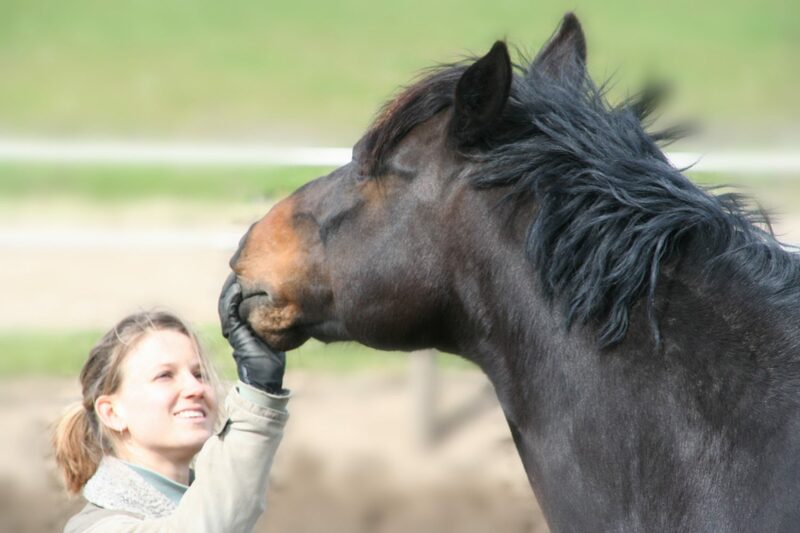 The combination results in a strong, fit and motivated horse, that will really have fun in working with you, because everything is based on respect, understanding, communication and trust. These ingredients are always important, independent of what you want to achieve with your horse. So just having fun, going into competition, jumping, trail rides etc. The main ingredients for success are always the same!